Fifa has reiterated the action World Cup referees can take if they are alerted to racist chanting at matches. The world governing body says officials will follow a 'three-step' process - to stop, suspend or abandon games. 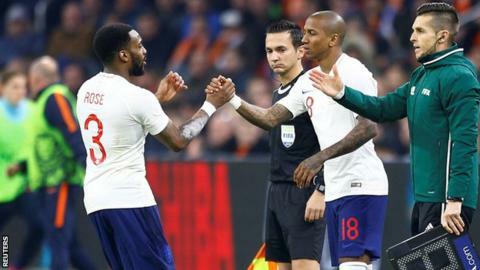 It comes after England defender Danny Rose said he was "numb" to racial abuse and has "no faith" in the football authorities' "justice system". Three Lions manager Gareth Southgate said the "idealist" response would be for players to walk off the pitch. But he added: "That means we would be thrown out of the tournament. I don't think the players would want that." Players who walk off would be shown yellow cards, and teams would risk being ejected from the competition. The Russian Football Union was recently fined £22,000 for racist chanting by fans during a friendly against France in March. What exactly is Fifa's 'three-step process'? What else is Fifa doing to reassure players? Every World Cup match will have three anti-discrimination observers in the stands, monitoring the behaviour of fans. The system was trialled during the World Cup qualifying rounds and the Confederations Cup. Anti-discrimination organisation Kick it Out said: "It is imperative that England players follow protocol and report any abuse they suffer to the referee. Fifa must ensure that officials enforce those rules so we don't see players disciplined for reporting discrimination. "There must be a swift and robust response from the governing body following any incident of abuse. Delayed, paltry fines will not be sufficient to foster an environment in which players are protected from discriminatory abuse."